OpenSimulator is a 3D Application Server. It can be used to create a virtual world which can be accessed through a variety of clients, on multiple protocols. OpenSimulator allows you to develop your world using the technologies you feel work best - we've designed the software to be easily extendable through [[Getting Started with Region Modules|loadable modules]] to build completely custom environments. OpenSimulator is released under a [[BSD License]], making it both open source, and commercially friendly to embed in products. Out of the box, OpenSimulator can be used to simulate a virtual world similar to Second Life™ (including client compatibility), however can be extended with modules to support MXP or realXtend clients too. For a list of availible third party modules, check our [http://forge.opensimulator.org/gf/ forge site]. Although OpenSimulator is still considered '''alpha software''', many people are [http://technorati.com/search/opensim?authority=a4&language=en doing exciting things with it]. * Supports creating multiple 'worlds' in a single application instance. * Supports online, multi-user 3D environments as small as 1 simulator or as large as thousands of simulators. * Extensive ability to customize your avatar, both with custom clothing, skins, and attached objects. * Realtime Physics Simulation, with multiple engine options including ODE, PhysX, Bullet and more. * The ability to create content real time in the environment using in world building tools. What you see is what you get. 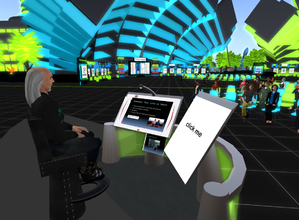 The fastest way to get started using OpenSimulator is to create an account on [http://osgrid.org OSGrid], then download the [http://opensim-viewer.sourceforge.net/ Hippo Viewer] or [http://secondlife.com/support/downloads.php Linden Lab's Second Life viewer] (amongst others) to connect to OSGrid. This process should take no longer than 10 minutes, and will give you a flavor for what OpenSimulator is like. You can also easily connect to any one of the many [[Grid_List|public grids]] on the internet. Or you could run a simple standalone OpenSim on your Windows desktop to create and preview content. [http://www.youtube.com/watch?v=ZcR7Jcar_8k Here is an tutorial showing how to get opensimulator in stand-alone mode.]. * Create an OpenSimulator related project hosted on the [http://forge.opensimulator.org Forge] or [http://opensimulator.org/wiki/Related_Software elsewhere] on the web. In the forge there are over a dozen registered projects, and it's a great way to further extend the OpenSimulator community. * Secure project infrastructure by [[Donations|donating]] to the [[Donations|OpenSim Project Infrastructure Fund]].